These chilly November days have me reminiscing about summer! This trip was the highlight of our camping trips this year. 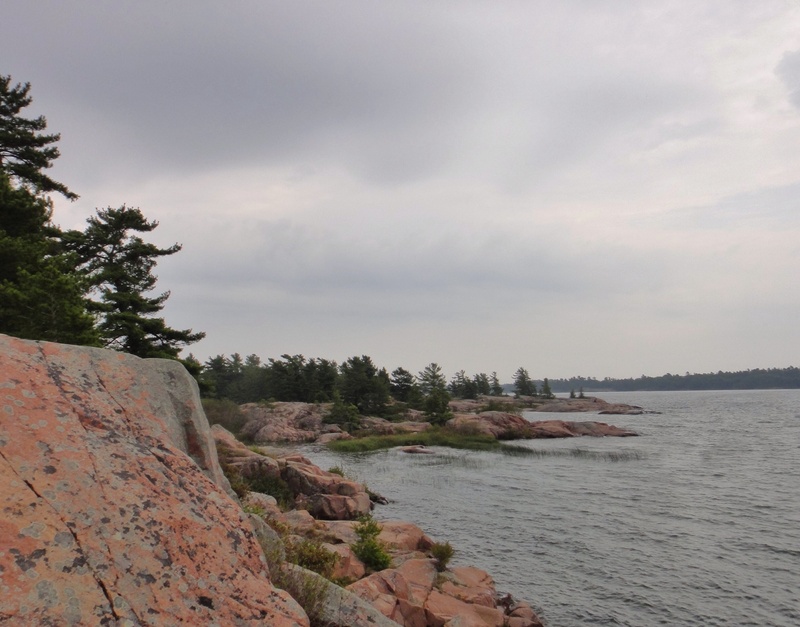 Killarney is often referred to as the crown jewel of Ontario Provincial Parks. 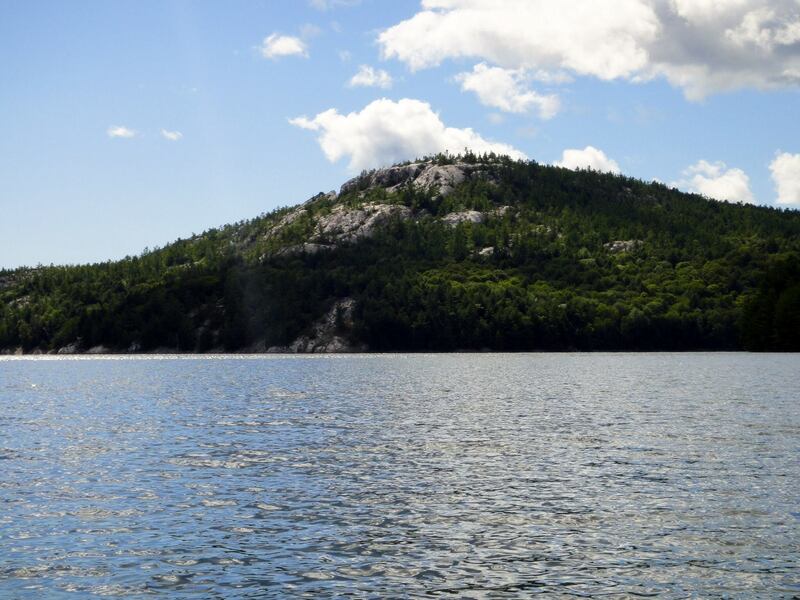 With its pink granite ridges, white quartzite La Cloche mountains, gorgeous lakes nestled among the rocky landscape and the views of Georgian Bay, the title is well-deserved. 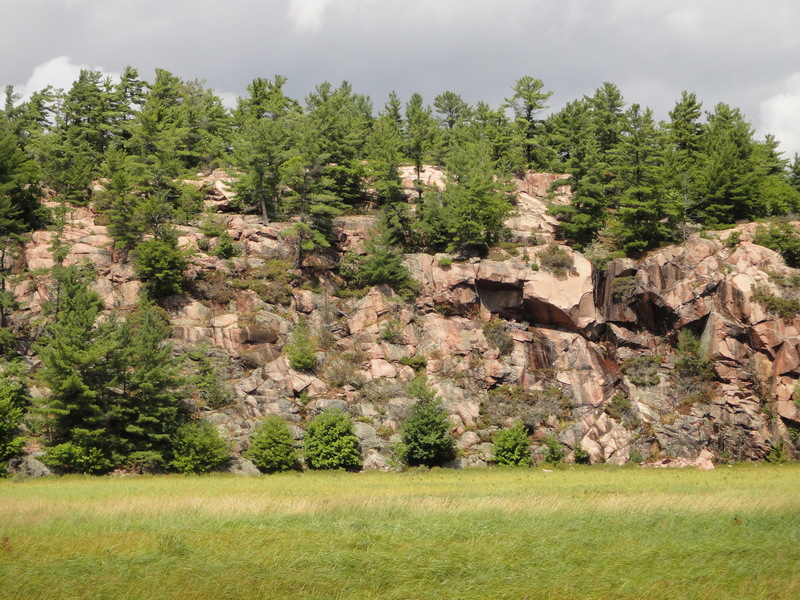 The park is located on Georgian Bay, 80 km SW of Sudbury. The drive into Killarney Provincial Park is beautiful and remote. Just getting to the park entrance is 60 km off the main highway. We rolled down the windows at the turn-off and let in the scents and sounds of the wilderness for instant immersion in the land that so many have fallen in love with. We arrived after dark – not intentionally, but road trips with 2 motion-sick-prone kids are sometimes iffy! Especially when you ditch the GPS and end up going on a very hilly detour! So, after some fresh air breaks, some cleaning up, and a very scenic route…we finally arrived 3 minutes after the doors were locked at the gate. We got a map and headed in – on a very dark night. Signage was not the best, though probably adequate in the daylight hours. We found the proper parking lot, texted our more punctual family members who were camping nearby, and joined them by the fire for drinks before grabbing a few of the available wheelbarrows to transport our belongings to our yurt. The gas BBQ (propane provided!) and picnic table were sheltered and located right outside our door. Very useful the night our campfire got rained-out. We fit 6 adults and 4 kids under the roof comfortably and continued on with our evening. The morning after the rain, we really appreciated the electric wall-mounted heater. We didn’t really use it much – the coldest it got was 12 degrees C, but it worked to take the damp out of our bedding and clothing! Within 10 minutes everything was dry again! This was our first experience staying in a yurt, and we definitely enjoyed the comforts it provided. We did 2 of the hiking trials. The Chikanishing Trail has a difficulty rating of moderate. It was really quite easy, even for my 4-year-old. Or maybe because she was 4! Lots of ups and downs over rocks, so perhaps her age worked to her advantage! Beautiful views of Georgian Bay, as well as some forested areas. It is a 2 km loop and should take around 1.5 hours. We spent a lot longer, just hanging out on the rocks and exporing. Plenty of great spots for a picnic. The Cranberry Bog trail also has a “moderate” rating, but we found it more difficult than the Chikanishing Trail. It is a 4 km loop which should take about 2.5 hours. We had rain over night and into the morning, so we waited until late afternoon, hoping the rocks would be dry by then. They mostly were, which turned out to be very important. This trail has more steep sections than the Chikanishing. My daughter needed a hand more than once, but it was doable. She’s a trooper though! I honestly wouldn’t have chosen this trail, because the term “bog” means “bugs that want to bite you” in my mind. I needn’t have worried. There were very few. It is a diverse and gorgeous trail. We spotted a pitcher plant, cranberries and mergansers, cliffs, marshes, crossed a beaver dam, climbed on rocks and walked through dark forest trails. It ends with a view of serene A Y Jackson Lake. We enjoyed swimming at both the beach and from the rocks near George Lake A Campground. Beach 1 is a smallish beach, but it was never crowded. In fact, a couple mornings I walked down with my coffee to enjoy a few moments of solitude. The water was fairly warm and the sand was nice and clean. My son’s favourite part was the spring water bubbling up out of the sand. We had fun building paths for it to trickle down to the lake. Crossing the bridge at the west end of George Lake, traveling down a shoreline path and carefully walking through the water got us out to the rocks. We had lots of fun jumping off the south side! My daughter was a bit young to play on the rocks – she needed a lot of help. A great option for slightly older kids! My 7 year-old had a blast. We rented canoes from Killarney Outfitters, located just 4 minutes west of the park entrance. Their rates are very reasonable and includes lifejackets and paddles. They even had paddles for the kids! Once we had paid for the rental and picked up the key, we headed to the beach at George Lake A and picked up our canoe from the Killarney Outfitter canoe racks. 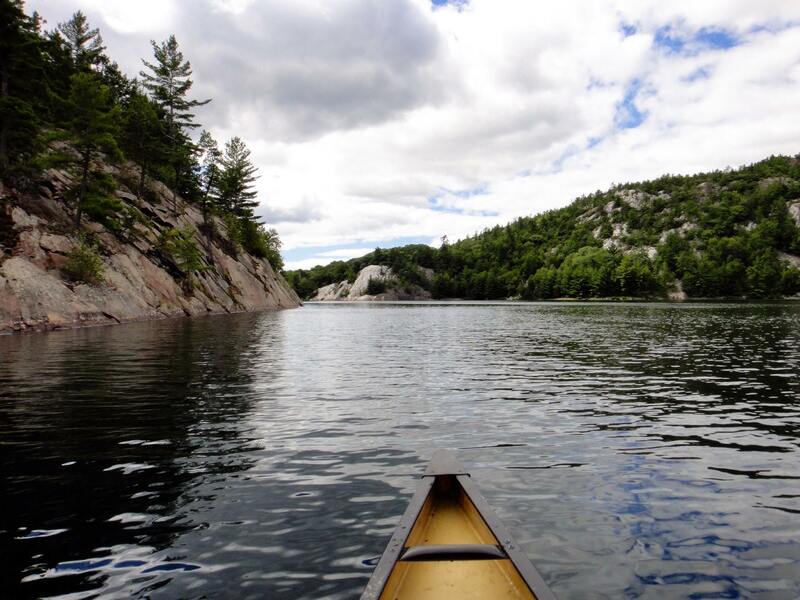 We canoed around George Lake and did a short, but rocky, portage over to Freeland Lake. We probably spent a couple hours just on George. We went past rock slides, cliffs, quatrzite mountains and sandy little beaches. We stopped and had lunch at a flat, tiny beach in a bay. We then headed for the portage. It was short, but the rocks made it a bit of a challenge with the kids. Freeland lake is pretty, calm and shallow. 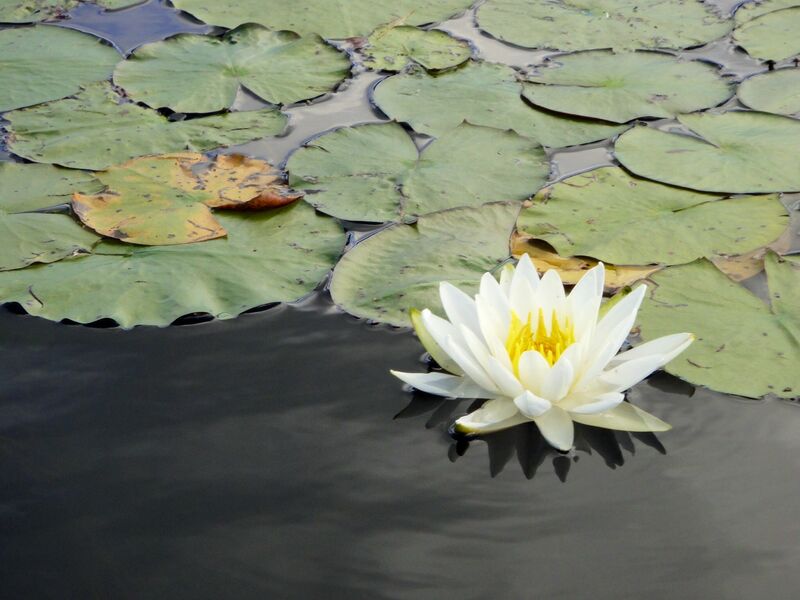 There are a few beaver dens and thousands of Lily pads. We enjoyed the peaceful stillness of the lake. If a wilderness experience is what you’re after, you’ll need to go backcountry. 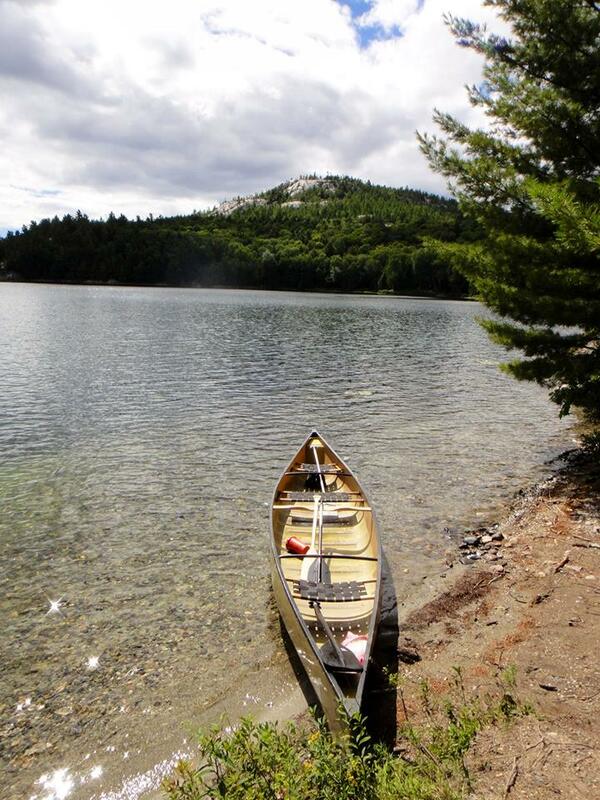 There are 183 backcountry canoe-in sites and 33 backcountry hike-in sites. Jeff’s Killarney Map and Killarney Outfitters can provide far more information than I! Our experience with George Lake was amazing, but definitely not wilderness! There are 128 car-camping sites and 6 yurts in the George Lake campgrounds.The car-camping sites are very close together and pretty small. Some have lovely views, or are backed by rocky formations, but most (all?) are wide open to the road or parking lots. The yurts at George Lake are a different story – I highly recommend them! This park is extremely popular, so advance-booking is a must. 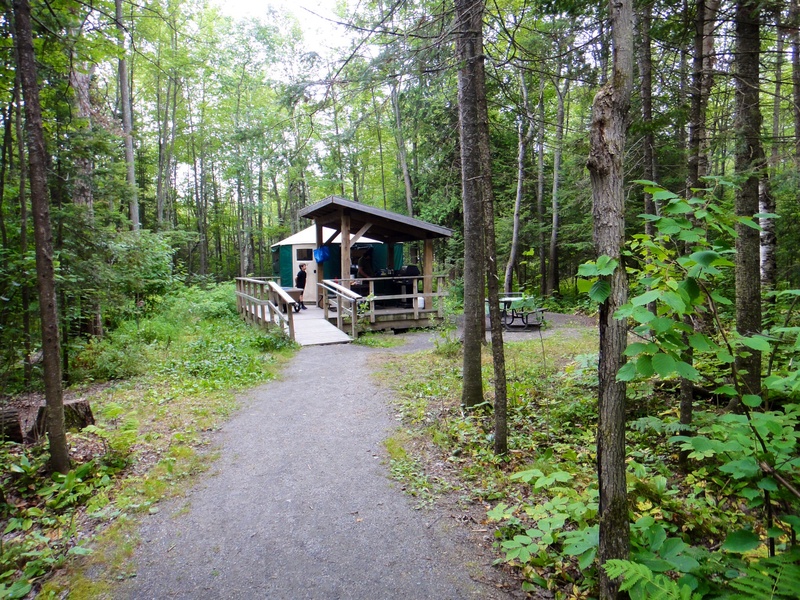 You can book a site at any Ontario Provincial park at 7am, 5 months in advance. I suggest logging in to the system before 7, and click the site you want right at 7:00. There were only 4 campsites and 4 yurts available in George Lake campgrounds the morning I needed to book. By 7:04, the campsites were gone and I had to book a yurt. While that ended up being for the best, it was lucky there were still some available! Killarney is, by far, my favourite Ontario campground so far!